Kubš, J., Gaff, M., and Barcík, Š. (2016). "Factors affecting the consumption of energy during the milling of thermally modified and unmodified beech wood," BioRes. 11(1), 736-747. This paper deals with an analysis of the energy efficiency of the milling of thermally modified and unmodified beech wood, taking into consideration the angular geometry of the cutting tool (milling cutter). The analysis was made using the METREL Power Q plus MI2392 device to measure the cutting power of the machine during milling with predetermined technical and technological cutter settings. The results were compared with respect to electricity savings in industrial production. The electrical power of the milling cutter, when machining thermally modified wood, was 5% less on average compared with the machining of unmodified wood under identical technological conditions. Recently there has been an increasing emphasis placed on the processing of natural raw materials, as well as their renewability. Wood is one of the most commonly used materials, as it is not only renewable but also mechanically resistant, easy to work, and aesthetically pleasing. This issue is closely related to the need to use less resistant tree species, in terms of moisture absorption, water absorption, and swelling. This problem is partly resolved by the so-called thermal modification of wood, which consists of a natural process of wood treatment without the use of chemicals, giving the modified wood better resistance to biological pests, weather effects, and discolouration. In its basic form, this thermal treatment has been known of for several decades, but it has been increasingly utilised recently as a result of technological advances and research into the properties of modified wood. Another imperative issue of today is the energy efficiency of wood processing, especially now that the price of electricity is increasing, and companies are striving to minimise their production costs. The thermal modification of wood is a method of modifying the properties of wood by the application of high temperatures, as has been done for generations; people used to burn the ends of fence posts to increase their durability. The process of thermal modification as we know it today was described theoretically in the 1920s, but its demanding nature did not yet permit full, trouble-free technological mastery (Bengtsson et al. 2003). Modern technologies have resolved this problem, and the industrial modification of wood started in Finland in the 1990s under the brand name ThermoWood®. The primary objective of industrial thermal modification was to transform domestic, easily accessible tree species into a product with properties similar to those of tropical woods. Thermally modified wood has been manufactured industrially for nearly 15 years now, though the concept was known earlier (Kugela 1958; Bekhta and Niemz 2003). Thermal modification of wood most commonly entails artificial drying, steaming, or boiling at temperatures between 50 and 140 °C. Relatively high temperatures (110 to 130 °C) affect wood during chemical protection with creosote oils. The thermal modification of wood is an intentional technological process in which its chemical structure is altered by means of increased temperature (150 to 260 °C), with a targeted impact on improving its resistance to water and biological pests. At the same time, however, the mechanical properties of the wood must not deteriorate noticeably (Reinprecht and Vidholdová 2008). Both dry and wet wood can be subjected to thermal modification. In the “ThermoWood” production process, thermal energy is provided either by electrical heaters or thermal oil reservoirs. The gases released from the wood during the technological process of production can be utilised for energy purposes by combustion, which also ensures that the environmental aspect of the production process is taken into account (thus, environmental pollution is avoided) (Dubovský et al. 1998). When assessing woodworking machines, one distinguishes between power input and power output. The motor power input (Pp) is defined as a product of voltage, current, and the power factor cosφ, i.e., power consumed from the electricity supply grid. The power input is an important parameter required for determining the energy costs or, e.g., sizing the required power supply line for the machine (Kretschmann et al. 1997; Zobel and Sprague 1998). The required cutting power (Pc) is the power input required for producing an adequate cutting force necessary for splitting a chip off the wood material during a technological operation. In other words, it is the amount of work exerted per second (Lisičan 1996; Jvorek and Osvald 1998; Barcík and Homola 2004). where Pc is the real power input for milling, PPR is the power input during milling, PPO is the power input running in idle, and ɳc is the overall efficiency of the woodworking machine. The material was extracted from the kiln when the wood temperature had decreased to approximately 70 °C. The treated thermally modified cuts were left at a relative humidity of 65% and a temperature of 20 °C to stabilise the moisture content. Afterwards, the planks were cut longitudinally (with a sizing saw) to a width of approximately 40 mm to 60 mm, then surfaced and planed to a specific thickness (with a surfacing planer and a thickness planer) to a thickness of 27 mm. After this treatment, the samples were fully prepared for the experimentation (Fig. 2). The research was carried out using an FVS single-spindle shaper along with an STEFF feeding device. Three two-blade wood milling cutters with replaceable, sharpened blades were chosen for this research. 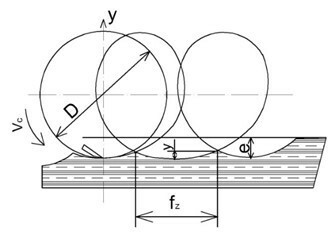 The milling cutters had rake angles (γ) of 15°, 20°, and 25°; the blades had an included angle (β) of 45°, corresponding to clearance angles (α) of 30°, 25°, and 20°, and cutting angles (δ) of 75°, 70°, and 65° (Fig. 3). The milling blade material specifications were: Maximus special 55 (19 855) HSS (high-speed steel); HRC 64; chemical composition: CO = 4.7%; V = 1.5%; W = 18.0%; Cu = 4.2%; C = 0.7%. The METREL Power Q plus MI2392 measuring device along with the computer had to be connected to the single-spindle milling machine (Fig. 4). The power supply cord from the (up milling) machine was disconnected from the terminals in the terminal box and reconnected to the supply grid via an auxiliary extension cable. The extension cable for the measurement was characterised by having a conventional feed and return as well as a third intermediate piece, in which the measurement device pins (L1, L2, and L3) were installed. 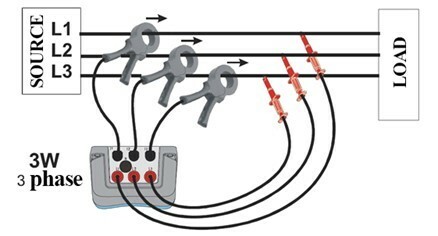 From this intermediate piece, the supply cable was distributed to each phase and each cable (phase) had a coil for sensing the flowing current (I1, I2, and I3) installed. All these auxiliary cables were connected to the measuring device, which was also connected to the power supply grid and linked to the computer via a USB cable. At the beginning of the measurement, the single-spindle shaper was set to a cutting speed of 20, 30, 40 m/s and fitted with a milling cutter with a face angle γ of 15°, 20°, 25°. This combination was used for testing one sample each of thermally modified wood and wood at three feed speed, which were vf=4; 8 and 11 m/min. All the data was progressively transferred to the computer and interpreted using Microsoft Excel 2010 and the STATISTICA 8.0 software by StatSoft, Inc. 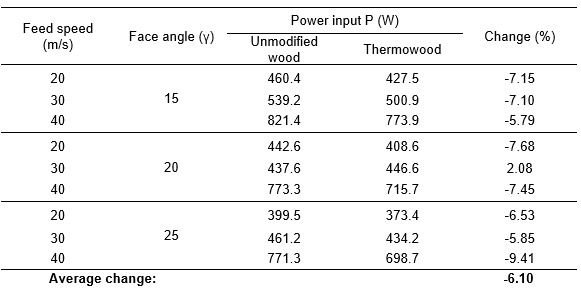 Figure 5 illustrate a decrease in the electrical power input when machining thermally modified wood (thermally modified beech wood, in our case) compared with unmodified wood. The difference was 5.95% on average. The cutting input increased with growing feed speed (Fig. 6). The average increase in the cutting input was 4.4%. The power input increased by 5.1% when the feed speed changed from 4 m/min to 8 m/min, and by only 3.8% when it changed from 8 m/min to 11 m/min. This means that there was a greater difference between the feed speed of 4 m/min and 8 m/min. The lower input increase between 8 m/min and 11 m/min may have been caused by the smaller difference between the feed speeds than is the case between 4 m/min and 8 m/min. The reason for the increase in the electric motor cutting power input with growing feed speed was that increasing the feed speed increases the feed of material that has to be machined in the same unit of time, resulting in increased cutting resistance and increased energy requirement for machining. Fig. 5. The average change (with all feed speed, cutting speed and face angles together) of power input (y-axis) between unmodified and modified wood during measurement. Flat milling was done with 1 mm removed from the wood. Fig. 6. 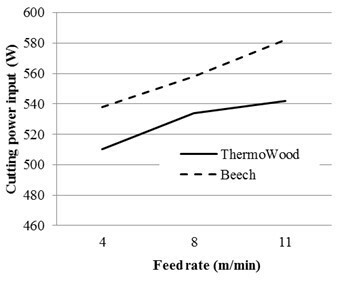 Dependence of cutting power input on feed speed 4, 8, 11 m/min between unmodified wood and Thermowood. Flat milling was done with 1 mm removed from the wood. It can be concluded from the resulting measurements (Fig. 7) that the cutting power input increased with increased cutting speed. It can also be concluded that the cutting power input increased further above 30 m/s than below that speed. This is mainly because of the fact that the shifting of the cutting speed from 20 to 30 m/s was done mechanically on the machine (shifting a belt on the shaft), whereas the change to 40 m/s was done electronically by pressing a button on the machine to double the motor speed. The average increase in cutting power input with growing cutting speed was calculated as 37.2%, with the average change from 20 m/s to 30 m/s being 12.1%, and the greatest difference between 30 m/s and 40 m/s being 62.3%. Fig. 7. 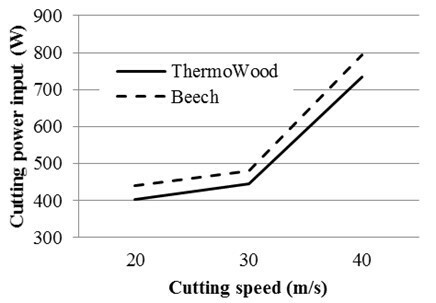 Dependence of cutting power input on cutting speed 20, 30, 40 m/s between unmodified wood and Thermowood. Flat milling was done with 1 mm removed from the wood. 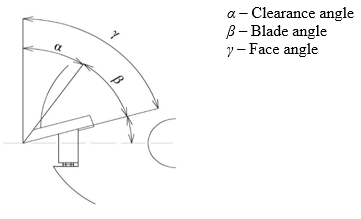 The face angle is the last measured factor influencing the machine cutting input (Fig. 8). The cutting input decreased with increasing face angle. The average decrease identified was 5.8%; the greatest change (−8.3 %) was between face angles of 15° and 20°, and the smallest change (−3.3 %) was between 20° and 25°. The results also indicate that the changes were more noticeable for unmodified wood than for thermally modified wood. Fig. 8. 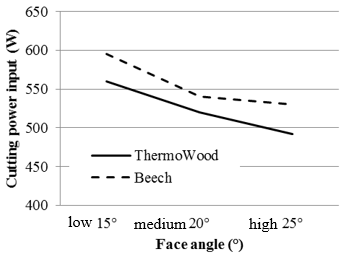 Dependence of cutting power input on cutting face angle 15°, 20°, 25° between unmodified wood and Thermowood. Flat milling was done with 1 mm removed from the wood. Changes in selected factors (such as cutting speed, sliding speed, and angle of the cutting head) with a goal of changing the energy performance in flat milling of course also can influence the quality of the machined surface. 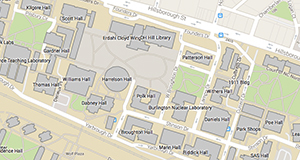 This issue is so extensive that it will be analyzed in further research. However, wood production is so diverse that some products (e.g. building joinery products, primary wood processing operations, and others …. ), surface quality is not significant. This the area upon which the present work was focused, where the primarily goal was to reduce consumption of energy in the production of these products. Given the unique nature of this research, not all the results can be completely compared with the existing literature (at least, not all the parameters at once). What can be compared are measurement results for certain parts (with identical technical and technological milling conditions). Only some of the results were compared with the work of Řehák (2009), who has been the only researcher to use identical technical and technological conditions when milling unmodified beech wood (Fig. 9). The comparison of results in Fig. 9 indicates that the present measurement was successful. Admittedly, the results of the current research show lower values than Řehák (2009) in all cases, but that may be due to measuring inaccuracy and, most importantly, because the cited work focused on milling beech wood with and without false heartwood. Thus, those results may be slightly overestimated because false heartwood has a higher density and hardness, making it more difficult to work, whereas the present measurements were only made on young beech wood without false heartwood. Another divergence may be allocated to different characteristics of the milling machine and blunt tools during milling. 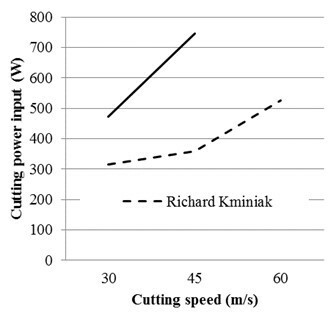 Nevertheless, both Řehák’s (2009) and the present measurements showed the same decreases and increases in the cutting power input effects in all cases when technical and technological milling parameters changed. An additional comparison was made with the works of Gondek (2004) and Lesko (2004), who examined the effect of cutting face and included angles on the energy efficiency of plane milling of juvenile Scots pine wood (Fig. 10). The chart indicates that their comparable results are almost identical to those of the present work, the difference being that pine is a softer wood type and its machining is therefore not as energy-intense as the beech used in the present research. The cutting speed in the plane milling of unmodified wood can also be compared in part with the work of Barcík et al (2007) (Fig. 11), who made a detailed examination of the energy efficiency of the plane machining of poplar wood. Again, comparable data from his work show identical tendencies, albeit with different values; this is due to the different wood type and different milling machine type. A final comparison can be made with a paper focusing on the effect of thermal modification during the milling of grown and thermally modified oak wood. Figure 12 indicates that these results, too, are very similar to the present measurements; the differences are again because of the different wood types and different milling devices used. 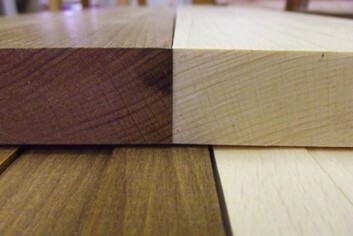 The outcome of the whole discussion indicates that this measurement was successful and should be expanded in the future to focus in particular on the most commonly processed thermally modified wood types, aiming at achieving the most efficient processing of this wood-based material by milling worldwide (Wilkowski et al. 2011). This research was carried out in order to optimize the technical and technological parameters of the milling of unmodified wood and ThermoWood, so as to achieve the required quality of machining along with the required energy efficiency. The most important factor affecting the cutting power input is cutting speed (37.2%); this change is so discernible that it can be quickly observed even in small-scale production. Another important factor in changing cutting power input is the face angle (5.8%). Changes in the feed speed are also noticeable in the amount of energy consumed (4.4%), but they are not as important as the two above cases, which is why this factor is more important in large-scale batch production. 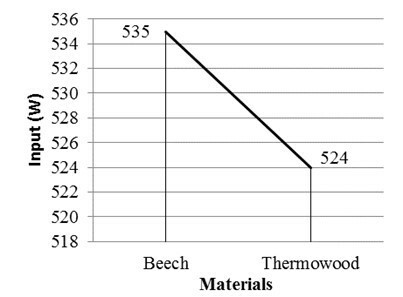 As with all the above-mentioned factors, the transformation of unmodified wood into ThermoWood has a non-negligible effect on the amount of energy consumed, making ThermoWood more economically efficient to process than unmodified wood (5.95%). Based on the assessment of this measurement, it can be stated that the following machine settings are the most convenient in practice in terms of energy efficiency: the lowest possible cutting speed, the highest possible cutting face angle, and the machining of thermally modified wood. The feed speed is a relatively inconsistent parameter in the present case because the cutting power input decreases at lower speeds, but the machining time is longer, whereas the machining time is shorter at higher feed speeds, while the machine cutting power input increases. Barcík, Š., Pivolusková, E., Kminiak, R. (2007). “Vplyv vybraných Technicko-technologických faktorov na energetické a kvalitatívne ukazovatele pri rovinnom frézovaní juvenilného topolového dreva [Influence of selected technical – technological parameters on the energy and qualitative indicators during face milling poplar wood],” Transfer 2007, Využívanie nových poznatkov v strojárskej praxi, Technical University in Zvolen, Slovakia, pp. 59-66 (in Slovak). Bengtsson, C., Jermer, J., Clang, A., and Ek-Olausson, B. (2003). “Investigation of some technical properties of heat-treated wood,” International Research Group on Wood Preservation, Doc. No. IRG/WP 03-40266. Dubovsky, J., Babiak, M., and Čunderlík, I. (1998). Textúra, Štruktúra a Úžitkové Vlastnosti Dreva, Technická Univerzita vo Zvolene, Zvolen, Slovakia. Gondek, T. (2004). Vplyv technologických parametrov na energetickú náročnosť pri rovinom frézování juvenilného borovicového dreva [Influence of technological parameters on the energy performance at face milling juvenile pine],” M.S. thesis, Technical University in Zvolen, Slovakia (in Slovak). Javorek, L., and Osvald, J. (1998). “Surface quality vs. technological conditions,” Acta facultatis Technicae Zvolen, TU vo Zolene, pp. 41- 46. Kretschmann, D. E., Alden, H. A., and Verill, S. (1997). “Variations of microfibril angle in loblolly pine: Comparison of iodine crystallization and X-ray diffraction techniques,” in: Microfibril Angle in Wood, Butterfield, B.G. (ed. ), University of Canterbury Press, 157-176. Kugela, I. S. (1958). “O frezovaniji listevnych porod drevesiny [Milling of deciduous trees],” Vol., 226 (in Slovak). Lesko, M. (2004). Vplyv geometrie nástroja na energetickú náročnosť při rovinnom frézování juvenilného borovicového dreva [The influence of instruments geometry on the energy performance at face milling juvenile pine],” M.S. thesis, Technical University in Zvolen, Slovakia (in Slovak). Lisičan, J. (1996). Teória a Technika Spracovania Dreva [Theory and Technique of Wood Processing], Matcentrum, Zvolen (in Slovak). Řehák, T. (2009). 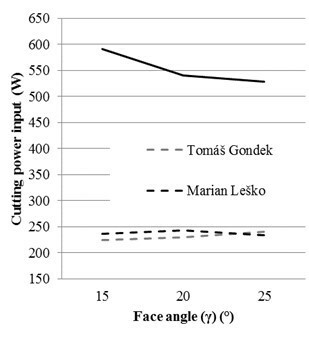 “Vliv vybraných technicko – technologických a materiálových faktorů na energetickou náročnost při rovinném frézování [Influence of selected technical – technological and material factors on the energy performance of face milling],” M.S. thesis, Czech University of Life Sciences, Czech Republic (in Czech). Reinprecht, L., and Vidholdová, Z. (2008). “Termodrevo – Príprava, Vlastnosti a Aplikácie [ThermoWood – Preparing, Properties and Applications],” Monograph, Technical University in Zvolen, Slovakia (in Slovak). Wilkowski, J., Grześkuewicz, M., Czarniak, P., Siwek, I., Javorek, L., and Pauliny, D. (2011). 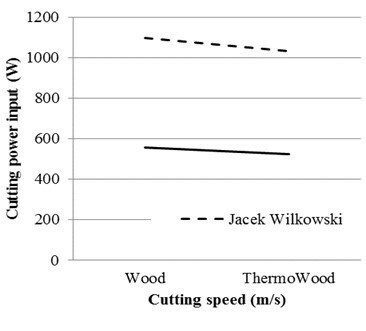 “Influence of thermal modification of oak wood on cutting forces during milling,” in: Drewno material ekologiczny: konferencja naukowa Wydzialu Technologii Drewna SGGW, Warszawa: Wydzial Technologii Drewna SGGW, 2011, s. 309–314. ISBN 83-86980-88-5. Zobel, B. J., and Sprague, J. R. (1998). Juvenile Wood in Forest Trees, Springer, Berlin. Article submitted: July 30, 2015; Peer review completed: October 16, 2015; Revised version received: November 3, 2015; Accepted: November 8, 2015; Published: November 25, 2015.